You may be familiar with the Geist drilling fixture and the Geist sanding fixture. They are sold through various penturning suppliers. They have a new product being readied for production: the Geist pen blank cutting fixture. It guides on your bandsaw miter gauge and makes precise cuts after an easy setup and adjustment. It is planned to retail for $30 and will be available through retailers shortly. For this review, I will first describe how it is used, and then summarize my reaction to the drilling fixture and the process. 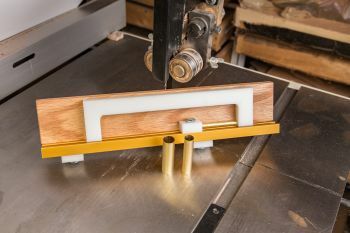 The Geist blank cutting fixture is crafted to make your pen blank cutting fast, easy, and uniform. 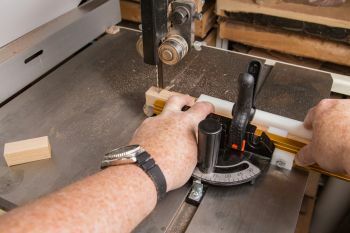 Before you setup up your Geist pen blank cutting fixture, check your miter gauge for perpendicularity to the guide travel. With the POWER OFF, adjust a square to almost touch the blade and clamp it in place with a squeeze clamp. Slide the miter gauge forward and check the gap at the back edge of the square. If the miter gauge is truly 90 degrees, the gap will be the same. 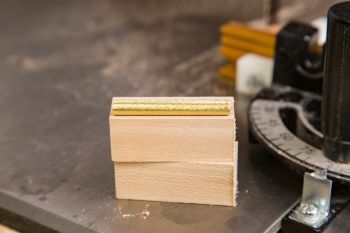 If the gap isn't the same at both ends of the square as you move it forwards and back, adjust the miter gauge until you have the same gap at both ends. It is now at 90 degrees, regardless of the what the numbers on the gauge indicate. There is often an error between the 90-degree marking and true perpendicularity. If you've had to adjust the gauge to something other than the indicators provided, make a suitable mark so you can easily return to the true 90 degrees in the future. Loosen the three plastic adjustable blocks so they will slide easily in the channel. Position the Geist fixture against the miter gauge and slide it until the end of the wooden platform just barely clears the bandsaw blade. Slide the left position block against the side of the miter gauge and tighten. 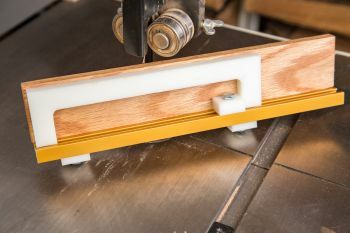 With the Geist fixture positioned against the miter gauge and the left position block, slide the right position block until it is firmly in contact with the right side of the miter gauge and tighten. The blank cutting fixture can now be removed as needed and can be easily and accurately positioned using these blocks. 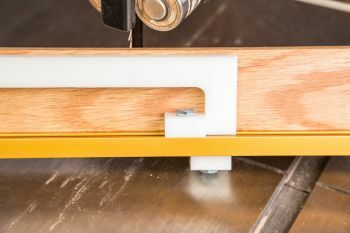 Position the plastic sliding cut-off guide against the extrusion and slide it until there is a slight gap between the end of the plastic guide and the end of the wooden platform. This gap will be the amount of excess wood when the blank is cut off. This is the total amount of excess, so you will be dividing it by two for the amount extending beyond the tube you are cutting for. Set it to allow for facing the blank after you have drilled and glued it in place. Whether you use a pen mill or a sanding method, this gap should be a minimal amount yet be sufficient to face both ends prior to turning. 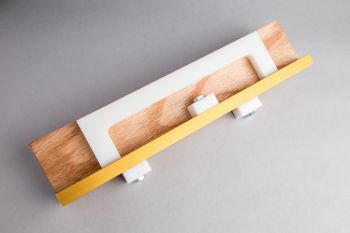 Once you have positioned the plastic sliding cut off guide to allow for the total excess blank length beyond the tube length, slide the plastic guide block to the inside right edge of the sliding cut off guide and tighten in place. Congratulations. 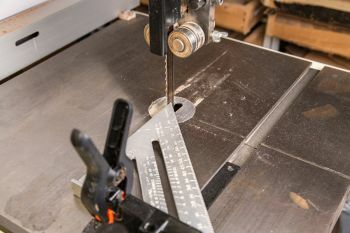 Your saw miter gauge is perpendicular to the miter gauge slot in your bandsaw and your Geist pen blank cut off fixture is adjusted and ready for use. Your fixture will be set for the proper cut off length including the small amount of extra you set when you adjusted the fixture. 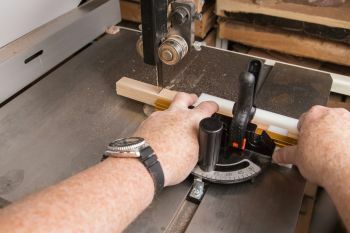 Placing the tube that you wish to cut a blank for between the right face of the stop block and the right inner face of the slide will set the proper distance. It works for any diameter tube and tubes up to 4 inches in length. 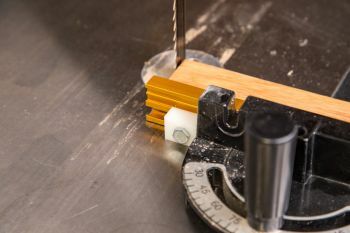 Position the fixture against the miter gauge between the blocks and use a squeeze clamp to hold it against the miter gauge. 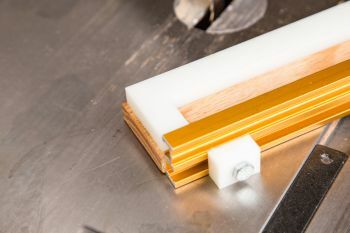 With the desired brass tube in position being held with light pressure, you can position your blank on the wooden platform against both the extrusion and the sliding cut off guide. Light finger pressure will hold the blank in place as you slide the miter gauge forward to execute the cut. As will all bandsaw operations, take proper care to keep your fingers and hands clear of the blade. You can cut blanks from a single pen blank to match the grain or cut from longer lengths within reason. Changing the length of the pen blank cut off is as easy as changing the brass tube in the fixture. Each blank will be have a perpendicular cut with respect to the face of the blank against the extrusion and the set amount of additional length for drilling and facing. The Geist pen blank cut off fixture is well made and easy to use. 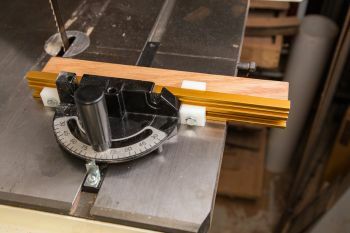 Once set, you can remove it from the bandsaw but quickly reposition it for use provided you haven't changed the adjustments on the fixture or the angle of the miter gauge. If your miter gauge readout is accurate, you can position it at 90 degrees easily after you've used it at a different setting. 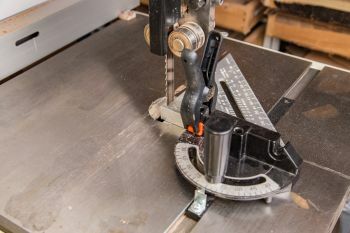 If you found that the indicators on your miter gauge were inaccurate when you did the squareness test and adjustment, and you made an accurate marking, simply return to that position when ready to use the Geist fixture. For a quick and easy way to accurately cut a blank, I think you'll find this fixture helpful and worth the cost. It should be available via the pen turning suppliers after the first of the year. Shortly you will be able to purchase the Geist Pen Blank Cutting Fixture at woodturning outlets or on the Geist web site. Please do not duplicate or distribute without permission.